Any woman 18 years or older who can prove lineal, bloodline descent from an ancestor who aided in achieving American independence is eligible to join the DAR. She must provide documentation for each statement of birth, marriage, and death, as well as of the Revolutionary War service of her Patriot ancestor. The first step to membership is to gather the genealogical information that you already have. This will be helpful when you meet with the registrar to begin the application process. The registrar will then go over any additional needed documentation, and help you get a game plan together. You are not in this process alone, and we are here to help you! 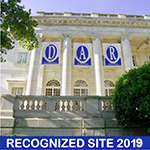 For more information about membership, please visit the NSDAR Membership site. If you’re interested in joining the Little Rock Centennial Chapter or have any questions, please use the contact form to get in touch with us.